I was going to show you a photo of the dinner I made Sophie last night because it looked so yummy.. But by the time I went and got my camera it was all gone! It was fish steamed in soy and ginger with brown rice and steamed greens (broccoli, green beans, snow peas, bok choi). 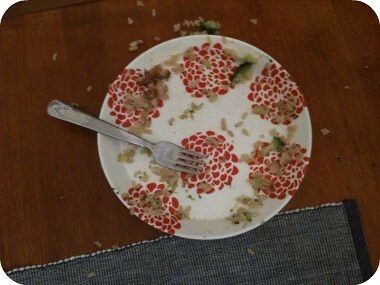 I then chop it all up in pieces for Sophie and call it "fishy rice". Its one of those dinners that I make when I can't think of anything else and I want to make a very quick meal that I know Sophie will eat. But the best thing is that Sophie eats it all and then asks for more and its full of vegetables! Mummy 1 -Toddler 0! I want some of that dinner! Sounds delish. And v impressed at Miss Sophie's sophisticated taste buds. If there is so much as the TINIEST speck of green in Baby Space toddler's rice or pasta he asks for it to removed. Sigh. - how much they actually consume!!! Little piggies!! Just wondering, how do you make perfect brown rice because every time I try, its pretty gloopy so I resort to white instead... hmmm. ps. love your blog, discovered it by chance recently and like to check in to see what happening in the East. I know! Sophie always likes food that I think she will hate.. like blue cheese and olives.. she can't get enough! As for the brown rice.. I use a rice cooker and put a touch more water in than I do with white. I also use short grain brown rice as it cooks quicker than long grain..